Prominent & Leading Manufacturer from Faridabad, we offer stainless steel hose clamp, heavy duty clamps, super grip clamp, square hose clamp, adjustable clamp and ss hose clamp. 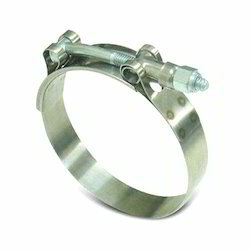 Stainless Steel Hose Clamp are manufactured from high quality stainless steel. 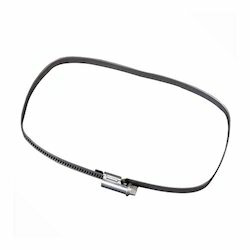 These SS Hose Clamps have smooth edges, can effectively prevent damage to the bundle of products. These Stainless Steel High Torque Hose Clamps are available up to the diameter of 160mm, with a recommended setting torque of 9.02Nm. The clamps can be customized as per clients requirement. We offer our clients with a wide range of Heavy Duty Clamps that are manufactured to meet the international standards. Our Heavy Duty Clamps are offered in various widths, thickness, material and surface finishing. These can be customized according to the specifications of our clients. We make use of the best quality of raw materials that are sourced from reliable vendors. 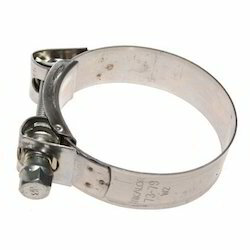 These heavy duty stainless steel clamps Type 302 / 304 can be customized as per requirement. Super Grip Clamps offered by us as industrial clamps that find usage in holding, clamping as well as binding together of rods, wires as well as other machinery products. 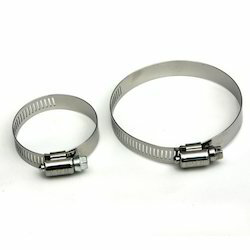 For ensuring in them durable finish support, these Stainless Steel Hose Clamps are made using quality material that provides stronger and superior gripping ability as well as long lasting finish values. Further, we provide these clamps with toothed gripping with superior fastening so as to provide optimum tightening conditions. We can also make these available in different finish sizes as well as design options to choose from. We are the manufacturer and exporter of Square Hose Clamp. These Square Clamps are mainly used in Trucks. These Clamps are made up of Stainless steel type 304. 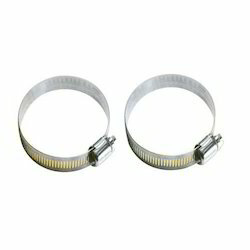 These Stainless Steel Clamps can be customized as per specifications. We believe in best quality and timely delivery to make a long term relation with our valuable clients. We manufacture Adjustable Clamp and these clamps are serving domestic as well as international market. We are the leading manufacturers and suppliers of SS Hose Clamp in India with the best quality.